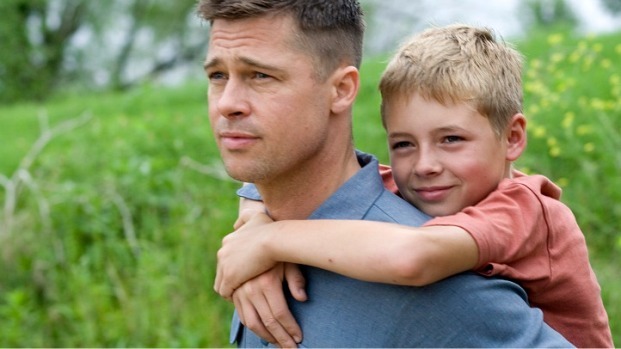 Amid Praise and Boos, Brad Pitt Found "Tree of Life" "Challenging"
Brad Pitt could work with just about any director he wanted to. And he wanted to work with Terrence Malick. At a screening of their polarizing new project “The Tree of Life” at the Los Angeles County Museum of Art, Pitt said that he and the iconoclastic auteur – who’s few-and-far-between films like “Days of Heaven,” “The Thin Red Line” and “The New World” are considered epic masterpieces in some circles, epic puzzlements in others – had quietly been looking for a project to collaborate on for a while. The film – which recently won the Palm d‘Or at this year’s Cannes Film Festival – follows an unconventional, meditative, existential and even surrealist path, in keeping with the Malick milieu. Behind the scenes, Pitt says the decidedly non-Hollywood production was equally unconventional. Because of the lack of definitive script, Pitt – famously, the father of six with partner Angelina Jolie – had to take care with the child actors playing his sons when it came to staging the scenes in which he terrorizes them.